El Chorro has some very steep cliffs. They are 180 meters high. 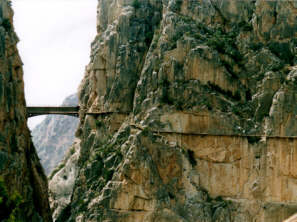 To give an impression of the astounding size of these cliffs, in 1921 a walking path along the cliff was made, the Camino del Rey (King's road). The path is visible on the pictures above. Al the travel books we saw (including the information in the nearby village) suggest you can still walk over this path. We found out that is NOT true. Although there are some people who don't seem to have any problems: watch this video. 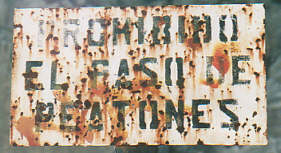 In fact, it hasn't been possible for over 15 years, as the sign below shows (it says: Prohibido el paso de peatones: No entry by foot). The footbridge to reach the start of the path has disappeared long ago, and large parts of the path itself are gone as well. Although forbidden, you can cross the water by taking the train bridge. However, we were impressed by the number of trains passing here, passenger-trains as well as freight-trains. 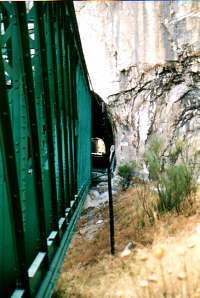 The track leads trough several tunnels to Bobbadilla, a place only people traveling by train ever heard from. 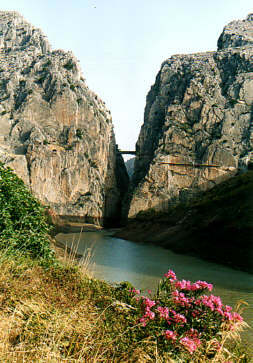 Although the Camino del Rey is closed, El Chorro is still a good starting point for outdoor activities. There are many marking walking trails here, including some long distance footpaths. And of course, you can do some horseback-riding, or go mountaineering. In town, there is an outdoor activities center, where they can tell you all about it. 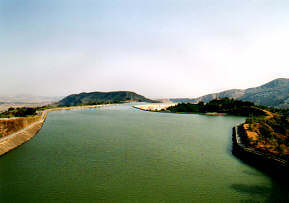 The water-driven power plant at El Chorro pumps at night water from the downside lake to this small lake at the top of the mountain. During the day, it can be used to fulfill extra demands. Bobastre is a Mozarabic church. This is a Christian church, made in the time that Spain was Moorish. It is located in the middle of nowhere. 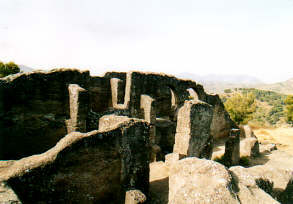 Bobastre is largely carved out of the rock, very ingenious. 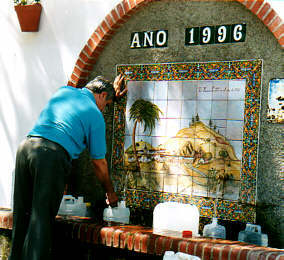 A little north of El Chorro lies Teba, a village on top of a mountain in an otherwise flat area. On the highest point of the mountain lies a castle (of course). 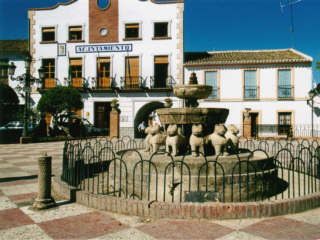 On the main square we found this fountain with twelve lions. It bears a remarkable resemblance to the famous one in the Alhambra (except for the Japanese tourists). Carratraca is well known for its sulphurous water. It should be very healthy. The baths are no longer in use (for at least 15 years). However: it looked like they were rebuilding them. A lot of people come here to get jerry-cans full of water. I hope they don't drink it: sulphurous water probably tastes like hell. Perhaps this is different water than the water in the baths.